Pacifiers. Scarves. Earmuffs. Reflectors. Lonesome gloves. Boots. Shoes. ‘Tis the season to be finding these things on the Swedish ground as the snow melts. I know, because I have a habit of staring at the ground when I walk. It results in me finding a lot of pennies. Lots and lots of pennies. But if you ever walk around in Sweden, you don’t need to be staring at the ground to notice all of the lost and forgotten remnants of people who have passed the very ground you’re standing on. In fact, it doesn’t even matter if it’s March and the snow is melting or June and the sun is high in the sky. No no. Because if you walk around in Sweden, you’ll start to notice something peculiar. Little lost and founds popping up in odd places. Fence posts. Retaining walls. Windowsills. Trees. Swedish forest. Did you lose it? There is a habit in this country to find things on the ground, pick them up, and place them somewhere visible to all. 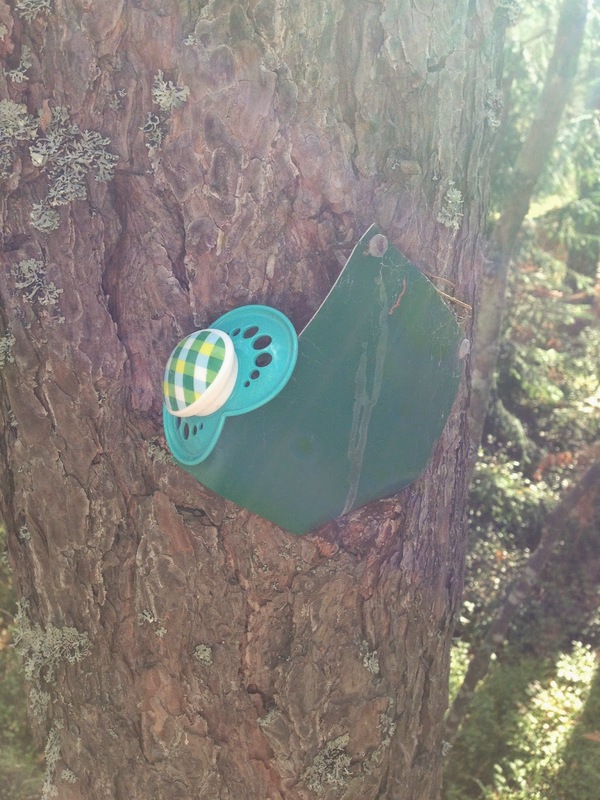 Find a pacifier on a path in the woods? Just hang it from a tree. The child who lost it will probably be by again to find it. Or at least the child’s representative. Notice a lost shoe? Just pick it up and place it on the nearest retaining wall. Is that a glove? Put it on the nearest fence post. Fence posts get cold too, you know. It’s all very cute, really. These little lost and founds. They’re so personal. So individual. As if the child who lost the pacifier will be able to tell their representative exactly where they threw it away in a fit of rage because they weren’t allowed to shove the pacifier in the dog’s mouth. Said representative will then retrace their steps, look about and think, oh no, I’ll never find a pacifier in the middle of the forest. It’s like trying to find a pacifier in a forest! But some kind soul will have hung the pacifier from the tree. Crisis averted. The child is happy. The child’s representative is happy. All is right with the world. There’s a lot that needs to go right to find that pacifier. But at least it’s hanging there, just in case. Lest I be too judgmental, I should note that I have done this more times than I care to admit. I’ve even been a part of a larger group that recently did just this. Five of us. A lost earmuff. Twenty steps from the front door of our friend’s home. Did we return the earmuff? No. Of course not. Instead, we placed it gently, visibly even, on the fence pillar and continued walking. It’s a spectacular way of doing something without actually doing something. I can go home and think, well, at least I didn’t just leave it there. I didn’t just ignore it. I made a difference. But probably not. Welcome to Sweden. And the lost and found.